This article is about the clannfear. For the set, see Shadowrend (set). Shadowrend is a shadowy clannfear encountered in the Banished Cells I. It is the namesake of the Shadowrend set, but does not drop any set pieces. As a boss type enemy, Shadowrend is immune to all crowd control effects. The clannfear swings its tail dealing high physical damage around itself as indicated by a red circle. This attack will also stun the player briefly. The boss summons a clone of itself that attacks the group. This clone has little health and should be killed quickly to simplify the fight. The boss jumps on a player and pins them down, dealing moderate physical damage. The player will be stunned for a moderate time after this. While on top of the player, the boss feeds on them to heal itself up. This also deals moderate physical damage over time to the player. To escape this, the player can break free; allies can also interrupt the boss to free their allies. Banished Cells I Vanquisher 10 Defeat Shadowrend and High Kinlord Rilis in Banished Cells I.
Banished Cells I Conqueror 10 Defeat Cell Haunter, Shadowrend, Angata the Clannfear Handler, the Skeletal Destroyer, and High Kinlord Rilis in Veteran Banished Cells I. 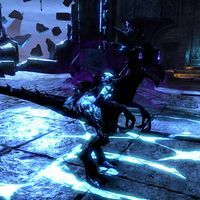 Veteran Daedra Slayer I 10 Defeat 100 Daedra in Veteran Banished Cells I.
Banished Cells I Survivor 50 Defeat Cell Haunter, Shadowrend, Angata the Clannfear Handler, the Skeletal Destroyer, and High Kinlord Rilis in Veteran Banished Cells I, without suffering a group member death. Banished Cells I Assassin 50 Defeat Cell Haunter, Shadowrend, Angata the Clannfear Handler, the Skeletal Destroyer, and High Kinlord Rilis in Veteran Banished Cells I, all within twenty minutes. Timer starts when a group member enters the first hallway. This page was last modified on 4 February 2018, at 22:08.